For young people under the age of 18. Build at least one wood duck nesting box according to an approved plan. Install the box, preferably on a pole with a cone guard as diagramed. Lip of cone should be at least three feet from ground. Trees are difficult to make predator-proof, but if you choose a tree, wrap a three foot strip of sheet metal below the box, four feet off the ground. Add another strip above the box if there is access from another tree. In time, grey squirrels are usually the first to beat the tree wraps. Have a photo taken with you holding the box, or a photo of you with the installed nesting box in the background. 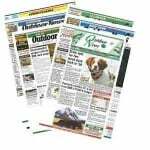 Send it to Outdoor News, or submit it electronically before May 15. Please mark envelope “Wood Duck Challenge”. Satisfaction for helping one of nature’s beautiful creatures. An Official Outdoor News Wood Duck Challenge waterfowl information kit and badge. Contact MWA at 952-767-0320 if you’re interested in purchasing wood duck boxes from them. The most common drawback of using wood to build duck houses is that when poorly constructed, they will last only a year or two before they literally weather apart at the seams. That is why Outdoor News recommend using cedar (rough side out), overlapping and sloping the roof, insetting the bottom, blunting or predrilling and setting all nails (Sheetrock screws also work well), as well as using thin “grip” or “anchor” type cedar shake nails 21⁄2 inches long (except to attach cleat spacer to rear wall, where 11⁄2-inch nails are used). Plans: Detailed plans can be downloaded here. Poles: Eight-foot treated landscape timbers (ﬂat on two sides) from any lumber yard. Discarded steel sign posts sometimes available free to conservation groups from highway departments. Angled support brackets: Purchase 1-inch steel right angle brackets and bend to 40 degrees, or purchase ready-made through Prairie Pothole Chapter at above address. If 4-by-4-inch square posts are used, brackets can be omitted by ordering MWI style cones. MWI cones have four “wings” that are bent up and attached to post. Questions? Question? Here’s a video that shows you how to construct a Wood Duck Nesting Box. Since annual cleaning and inspection are an important part of wood duck house projects, easy access is a must. Hinges add expense, and houses with roofs that open up for cleaning are not very strong. Plus, the nest material is a long, sometimes dangerous, reach from the top of the box to the bottom. The simple side wall access door pivoting on two nails permits convenient, safe side access and a much sturdier box. An added benefit of the side access door is how it simplifies post installation. Note: Placement of the cleaning/access door on the right side wall as you face the front of the house makes installation handy for a right-handed person. Traditional wooden duck house designs have wasted some wood and created a real “monster” when it comes to carrying and mounting the heavy beasts. Female woodies, goldeneyes, and hooded mergansers prefer this snug, 8-by-8-inch interior box dimension, and it can make the boxes much lighter and easier to carry and install. A 3- by 4-inch duck entrance hole and an 18-inch distance from the bottom of the duck entrance hole to the bottom of the house (17-inch inside distance) are important dimensions to frustrate raccoons and help the hen or the nest survive an attack. Never add a perch to the front of the house. Ducks don’t need it, and raccoons use it for a better grip during an attack. Select a relatively open area to pole-mount duck boxes. Face the boxes toward an open “flight lane” where woodies are likely to fly by and see the entrance from a distance. Placing the boxes near or over water accomplishes this, as well as being close to where woodies are more likely to spend a lot of time. Don’t rule out posts not close to water. Early morning observation during the nesting season often will reveal pairs of woodies searching favorite areas for nest sites some distance from the closest water. Since raccoons are notorious shoreline predators, these more distant nest locations may be less bothered by raccoons. Also, don’t be concerned about placing your nest box close to your home or other human activity. Woodies and other cavity-nesting ducks are very tolerant of human comings and goings. Install your house via the relatively low pole-mount method described also in this issue. Drain holes are not recommend in this house design. Everyone in the woodworking area should wear safety glasses. Adults should closely supervise the use of all tools. Power saws should involve “hands on” adult supervision – if not actual completion by an adult. Use grade 3 cedar, rough one side. Sides/front/back/floor 1 inch by 10 inches (actual 3⁄4 by 91⁄4). Roof —1-inch by 12 inch (actual 3⁄4- by 111⁄4 inches). Rough surface goes out on completed house. One “side” will be smooth unless you make an even number of houses and alternate the direction of your cross cut. Add 4 inches of cedar shavings as nest base material. For additional information, contact the Wood Duck Society at (651) 429-8007. Realtree is the official sponsor of the 2017 Wood Duck Challenge.